…Plus the Delight of a Magic Show! Who doesn’t love balloons?? Learning how to make balloon animals has never been SO MUCH FUN. Imagine the look on all the faces when they are surrounded by hundreds of inflated modeling balloons. Then tell them there’s a magic show as well. I’m school assembly & library show performer Cris Johnson. For the last 20 years, I’ve traveled all over the U.S. and Canada performing for audiences of all shapes and sizes. I understand kids and, perhaps more importantly, I know how to relate to them – probably because I’ve been accused of having the maturity of a 5 year old! All of my shows feature goofy, age-appropriate humor, magic, games, music, join-in fun, and more. These features help keep audiences of all ages focused on my presentation. Let me say it again: my programs use more audience involvement than you can shake a stick at! (I’m not sure why anyone would WANT to shake a stick, but that’s the saying). 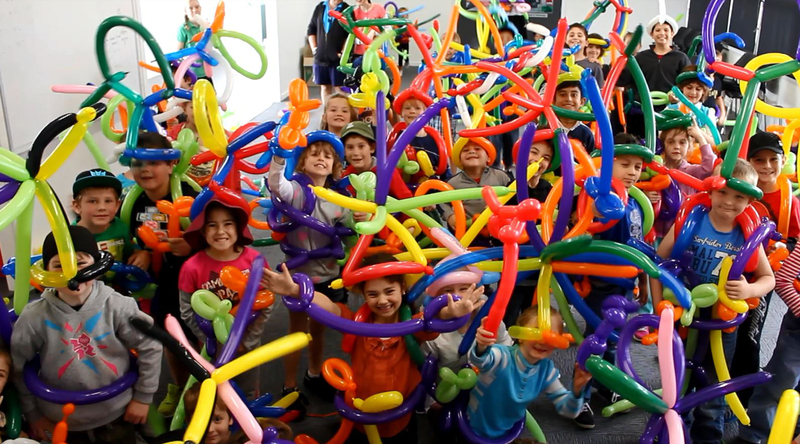 For the Balloon Workshop, I will even have ALL of the kids involved! Most importantly, I offer a “Better-Than- Money-Back-Guarantee,” meaning if you are unhappy with the show for any reason, you’ll receive a full refund PLUS $500 donated to your school or library treasury…and in nearly 20 years of professional work all across North America, no one has ever taken me up on my guarantee! 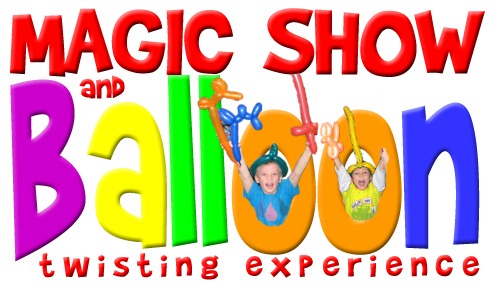 Introducing…The Ultimate Balloon Twisting Experience & Magic Show! 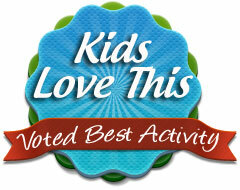 Kids and families love the Ultimate Magic Show and Balloon Twisting Experience. You get a hilarious “warm up” Magic Show by me followed by the hands-on Balloon Twisting workshop with my Big Bag of Balloons where you learn how to make balloon animals then your own C-R- A-Z- Y balloon hats. The Ultimate Magic Show and Balloon Twisting Experience is one of Western New York’s favorite family experiences. The truth is adults have as much fun as the kids. Come on, who hasn’t ever wanted to try some Balloon Twisting, even just once? Book the Ultimate Magic Show and Balloon Twisting Experience for your next event and all you have to do is provide the space. A great time of fun, interaction, and laughter that gets people mixing, talking and laughing. Your guests leave happy… very happy. The Ultimate Magic Show and Balloon Twisting Experience is colorful, interactive, extremely photogenic and very, very memorable. Magic and Balloon Fun that gets people mixing, laughing and talking at your event and about your event. Call me at (716) 940-8963 (that’s my cell phone) or email me at cris@elementaryschoolassemblies.com. Click to see just a few of Cris’s company clients! 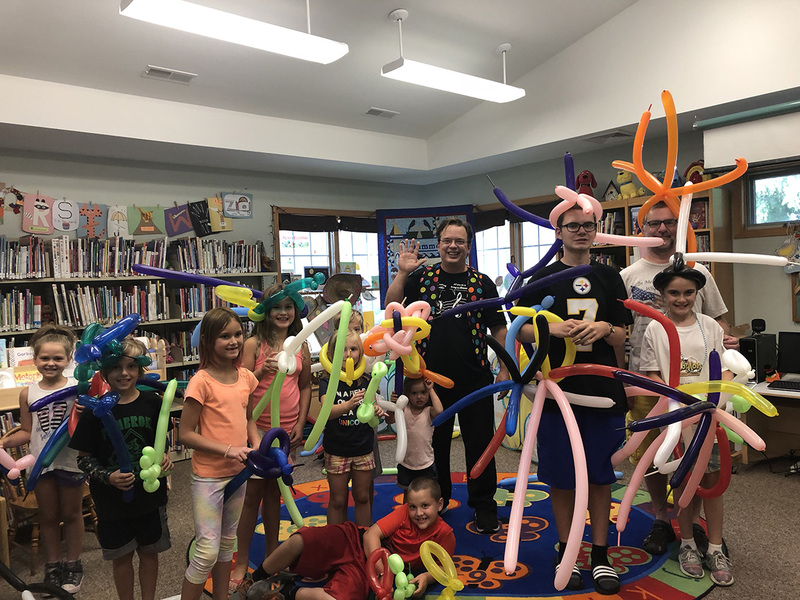 If you are looking for a fun program for kids when school is out for a break, look no further than Cris Johnson’s Magic Show and Balloon Twisting workshop. I have had other balloon twisting workshops in the past, but none held a candle to this one. Cris literally came with hundreds of vibrantly colored twisty balloons all blown up and organized for quick and easy action. He started his show off with his signature magic show then, with the kids attention focused, he taught kids as young as four years old on up to senior citizens how to twist and contort the balloons into a variety of fun things. There were swords and holsters, butterflies, dogs, jet packs and even a crazy hat! Once the kids (and adults) had the hang of the basic skill set, he let them all have at it on their own. The organized chaos was absolutely fascinating to watch! Children loaded up with armfuls of balloons and let their newly learned skills loose. The kids used their imaginations and creativity to twist up all sorts of crazy critters, goofy hats and suits of armor. Every single child (and adult) left the program with a smile as long as the Nile! As expected, this show was a grand success, and I you can bet that I will continue to think of Cris when I am looking for a family friendly, seriously fun program to host at the library!